Now, it’s more like honing my skills or adding another tool to the toolbox to move forward in this process of becoming. It seems to me that self-improvement is just a concept with no substance, no foundation in the field of Reality. I wasn’t trying to convert my daughter. I was just speaking my truth. *I may have stolen the title of this blog from Popeye. Last year, TPRF partnered with The Adventure Project to help transform fifty farmers into profitable entrepreneurs in Kenya. We are proud to report that those farmers have moved from poverty to the middle class, and are sending 75 of their children to school for the first time from the money they earn selling produce. Here is a story written by guest blogger Becky Straw, Co-Founder of The Adventure Project, demonstrating the impact this gift is making to feed the hungry in Kenya. I wish I could take you here. I wish I could take you by the hand and sit you next to me on Hannah’s couch to experience her story in person. Upon our arrival, Hannah shrieked playfully, like so many women would, “You have arrived early, don’t film me yet – I haven’t done my hair!” We laughed and nodded in understanding as she ducked into the next room. His neighbor is a hotel manager, and he has a good house, he admitted. There’s also a chance that the President might come into his hotel, and that would be very exciting. It’s a modest dream, but it’s achievable. It’s possible because he has excellent grades and because of his family. Because of his mother. Kuyu, the marketing manager for Kickstart, looks at me and smiles, speaking softly, “It’s funny that she wraps it like this. It’s chip-resistant paint. It’s not going to rust or be damaged.” Hannah has had her pump for two years. It still looks brand new. We tread carefully down a slope to her small garden, walking through trees until we reach a clearing where the sky opens up before us. Fruits and vegetables of every variety lay in neat little rows. Huge fuchsia flowers bloom wildly along her fence. It’s an unexpected Eden. Carefully, she unwraps her pump and goes to work. 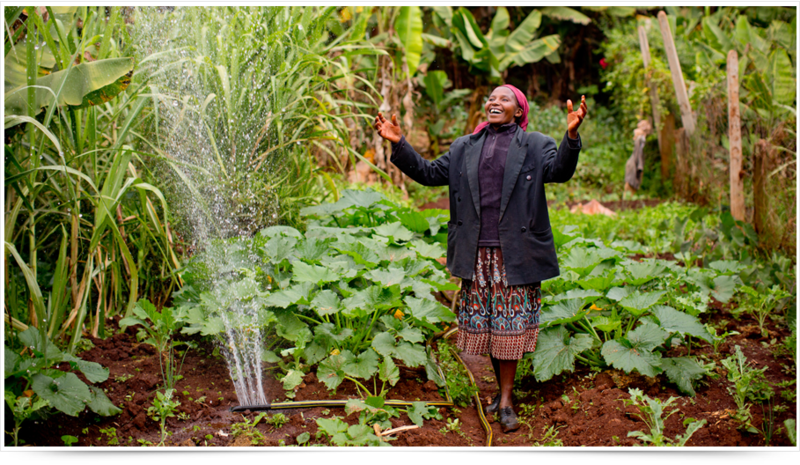 Hannah’s farming business has tripled since she purchased her irrigation pump, a fact she is keenly aware of. Her story is not unique. The benefits of one pump are astronomical. A pump can increase harvests by 3-4 times per year and can irrigate up to 2 acres of land per day. One pump has the ability to move a farmer and their family from poverty into the middle class in just one harvest. The irony of Africa is that 75% of all subsistence farmers’ children go hungry because they cannot grow enough to even feed their own families. With an irrigation pump, farmers suddenly have so much food that they can sell their surplus in local markets. They earn enough to send an average of 1.5 of their children to school for the first time. As hard as I try, I can’t think of any single item in America to compare the pump to. What’s the one physical item we have in the U.S. that can transform a poor family struggling to feed themselves into nearly instant middle-class entrepreneurs? After Hannah finished watering her garden, she grabbed her old bucket, filled it with water from her small well, and did something I didn’t expect. She began painstakingly washing every inch of her pump free of mud and dirt. Thoughtfully. Methodically. As if she was caring for a precious child. After twenty minutes she carefully took the pump, laid it on the plastic, tied it up with string, and rolled the hose into a neat coil. I asked if she followed this routine every day. “No,” Hannah replied. “Plants only need to be watered every other day.” In her own way, she answered my question. I took my notebook out of my backpack and wrote one word in the margin. Value. Hannah and her husband bought this pump themselves. The Adventure Project is helping to subsidize the costs of Kickstart’s program, so that the pump can be sold at an affordable price. 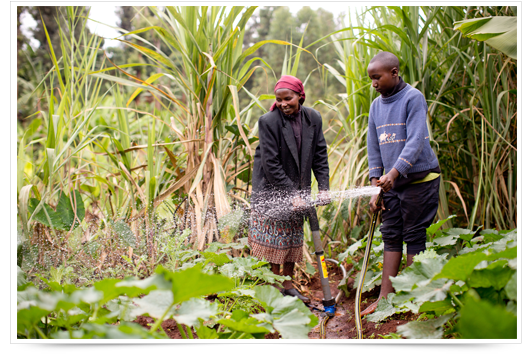 No determined farmer is too destitute to pay, and Kickstart has even developed an extended payment program for those truly in need. With the income generated from selling her crops, Hannah has invested in chickens and now sells eggs along with her produce. She can also afford her son’s school fees, and he will never miss school again because they can’t afford to buy him shoes and socks. No longer toiling all day under the hot sun, carrying a bucket, plopping water and drenching seedlings, Hannah now has time for her favorite activity, she tells us joyfully – teaching Sunday School at her church. I cannot think of one investment more precious. More valuable. This is the Kenya I know and love. The story I want you to be part of. There is no longing. No begging. No swollen bellies or hungry eyes. If there are tears, they are mine. And maybe yours. Welling with happiness. For me, I know I’ve found my calling. The opportunity to play a small role in giving something more valuable than gold; a job. 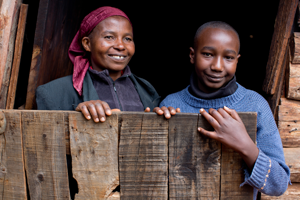 Friends, we have set an ambitious goal: we want to help 323 other families in Kenya this year. Every $400 will get one pump to a farmer in need. If successful, our funds will help 323 farmers grow enough crops to become profitable – feeding 25,000 neighbors and sending 500 of their kids to school for the very first time. Imagine giving someone like Hannah the opportunity of a lifetime. “The Adventure Project is incredibly honored and grateful for all TPRF has done to support food, water and peace around the globe. Your support for our Hunger Campaign has directly benefitted thousands of people, and your $10,000 gift created jobs for 25 farmers last year. We cannot thank you enough for all that you done and continue to do to make the world a better place. 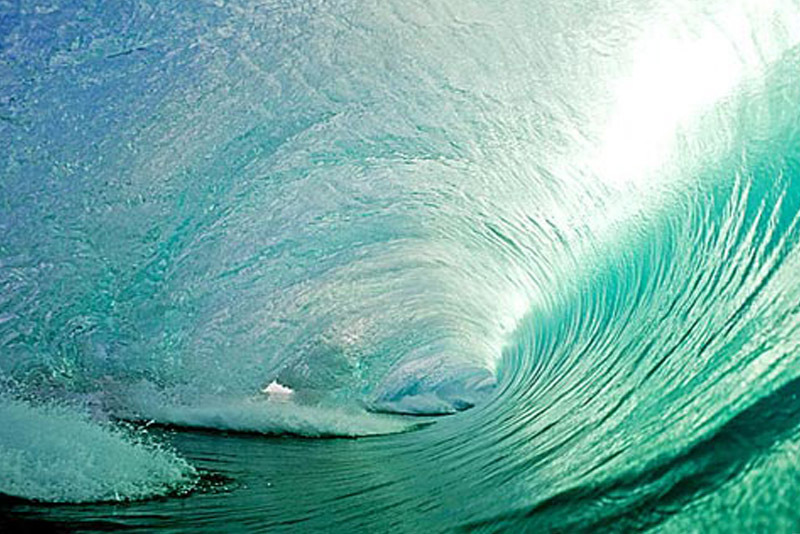 Thank you.” – Becky Straw, Co-Founder of The Adventure Project.